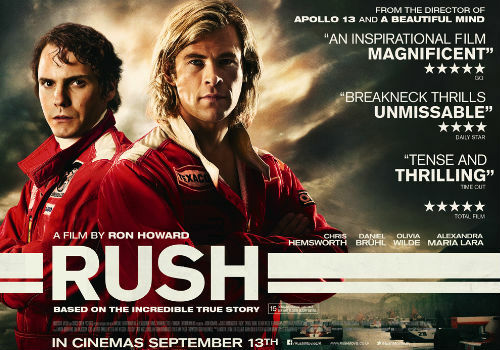 If you’ve landed here hoping to learn about the visual effects of Ron Howard’s Formula 1 film Rush, I’m afraid you’re going to be disappointed. Yes, I’ve finished my article on that very subject and yes, I’ve submitted it to the publishers. But you’ll have to wait until it appears in the winter edition of Cinefex to read it. However, if you’ve a passing interest in how a writer of fiction adapts his process to tackle research journalism, read on. The starting point for my article was over 25,000 words of interview transcript – check out my earlier post about the interviews here. My challenge was to weave this research into an 8,000-word account of the making of a modern motion picture’s visual effects sequences. 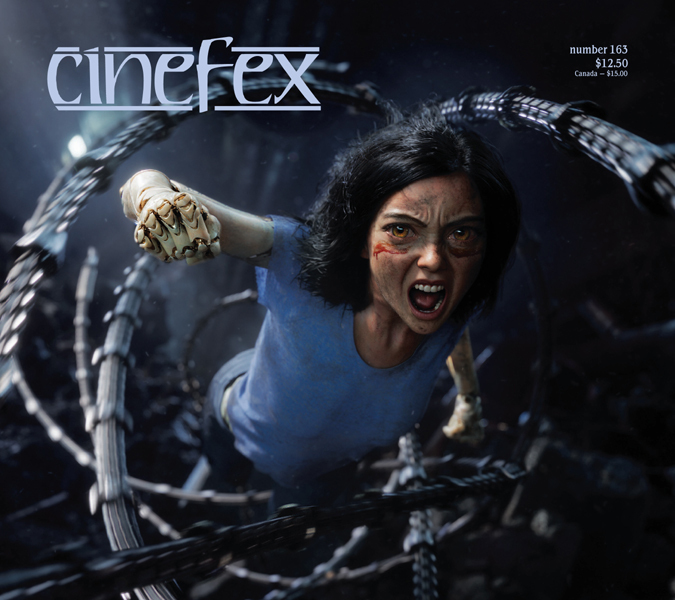 The Cinefex house style requires the writer to avoid editorial comment and simply present the facts – no mean task when you’re juggling input from nine separate contributors, each describing a different facet of what is a highly technical process. My initial attempts to start at the beginning and plough through to the end met with disaster. Because filmmaking is an organic process involving many different departments working concurrently, it wasn’t immediately obvious where the beginning even was. So I ditched the idea of writing the manuscript in a linear way and turned to index cards. Of the digital kind, of course. 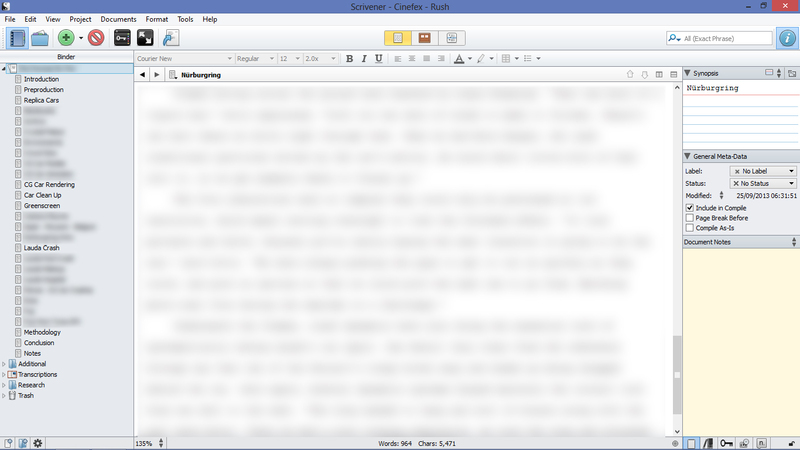 Scrivener screenshot of my Rush article in progress – click to enlarge. Oh, and bad luck, I’ve blurred out the text! My favourite piece of writing software, Scrivener, comes equipped with a neat system whereby you can create individual text files that work either as separate cards (you can even view them pinned to a virtual corkboard), or which you can dynamically flow together into a single manuscript. Similar outlining systems exist in other word processors, but the intuitive way Scrivener handles its files is hard to beat. As a bonus, it can manage all your research documents too: transcripts, web pages, even multimedia. Had I chosen to, I could have loaded all the audio files from my interviews into the main Scrivener project file (I stopped short of doing this for fear of initiating a laptop meltdown). Having worked all this out, I plunged straight into the middle of my research and wrote a card about the location shoot of Niki Lauda’s 1976 crash at Nürburgring. I chose this because it was the area in which my research was clearest. From there, I skipped from transcript to transcript, adding cards in no particular order as the mood took me. I didn’t worry about the structure of the article, simply concentrated on sifting information from the transcripts. I also began to add my own snippets of text to give context to the quotes, elaborate on the details and fill in the gaps. As I referenced each section of an interview, I changed the colour of the transcript text from black to light grey. The more I lifted from them, the more the transcripts faded. Browsing back through them, I could tell at a glance if I’d missed anything. Eventually I had a research folder haunted by ghostly copy and a chaotic project folder full of index cards detailing the film’s entire visual effects process. To pull the article into shape, all I had to do was move the cards around until some kind of order asserted itself. Then, once the article’s structure had finally emerged, I had to rewrite everything. I’ve no doubt this organic process is familiar to any writer who’s tackled an assignment like this. But this was my first time, so I had to work it out for myself. The only real complication was a last-minute interview with a new contributor, and an eleventh-hour viewing of the film, which had just been released in the UK. Both forced me to rethink things a bit, but without them the article would have been less well-rounded. Once I was happy, I emailed the final draft to Cinefex editor in chief Jody Duncan. She made a few editorial tweaks, after which I sent the manuscript round all the contributors for a technical check and, having accommodated their revisions, fired it back across the Atlantic to Jody. So my work is done. I can sit back and relax while the Cinefex team works its magic to incorporate my 8,000 words into a perfect-bound printed journal lavishly illustrated with colour photos, a matching online version and a spectacular iPad edition enhanced with additional images and video content. 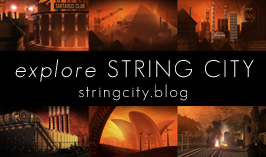 As for how all that is achieved … that’s another story!